Great and Holy Week refers to the final six days before Easter. Easter is known in Byzantine and Orthodox Churches as “Pascha” and is the most important holy day of the Liturgical calendar, referred to as the Feast of Feasts. The Liturgies and Services during Great and Holy Week remind us of the historical events that occurred over 2000 years ago. In these we are invited to journey spiritually with Christ, in his Passion to the cross, and ultimately rejoicing in His glorious Resurrection. Great and Holy Week is a journey of our repentance and our redemption: of forgiveness of our sins through sacrificial love given freely to us by our Lord and Savior Jesus Christ and for all who place their hope and absolute trust in Him. Attending all or a few of the many Holy Week Liturgies and services is a chance to reflect and consider all that Jesus did for us. Our quiet time and walk with God is a source of grace. It is an opportunity to allow God into our hearts, especially when we are open to His grace amidst all the busyness that so often steals our focus away from Him. We grow closer to God also with reception of the Sacraments and with the spiritual enrichment obtained from increased prayer and reading or hearing Scripture during this most sacred week. The Byzantine Catholic church offers the faithful a time to receive Holy Communion during Great and Holy Week with the Liturgy of the Presanctified Gifts. (See Liturgy Schedule). The Liturgy is held Holy Tuesday, and Holy Wednesday. Unique in the tradition of Byzantine Catholic churches, Holy Wednesday is an occasion for all faithful to receive an additional Sacrament of the Church. Those present are invited to be anointed with holy oil in the Sacrament or Anointing of the Sick. In Eastern Christian churches, this is a longstanding tradition, apostolic in origin. The Anointing is imparted on the palms of the hands of each person by the priest. This Anointing is not to be confused with a sacramental type of blessing with oil called mirovanije, given following the Divine Liturgy on Holy Days. The Anointing of the Sick offered during Holy Week is one of the seven Sacraments of the church, the value of which is in the healing of mind, body, and soul. This is in recognition that all of us have need for some form of healing, including spiritual healing. Anointing of the Sick is not limited to only those with grave illness or in approach of impending death. It is an important Sacrament for all believers. Receiving this Sacrament during Holy Week is a special privilege in relation to and with anticipation of Christ’s outpouring of love for us; and with the steadfast faith that Jesus wishes all of his followers to have. We call to mind the many instances in Scripture where Jesus healed those who sought his help with their total trust in Him. In faith we can obtain the graces and spiritual healing that Jesus, the great Physician of Souls is so ready to offer to those who seek and ask. 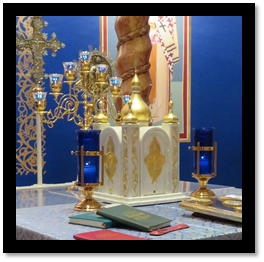 *** Sacrament of the Sick is offered on Holy Tuesday at our sister church, St. Nicholas Church, Swoyersville. The significance of Holy Thursday for the Church is great. On this day we commemorate when Jesus instituted the Sacrament of the Holy Eucharist and also the Sacrament of Holy Orders, the priesthood. And on this day, Jesus also models for us (with the washing of the feet of his apostles), the role of humble service we are to imitate and strive for in our daily lives. Prior to his Passion and crucifixion, Jesus gathered with his apostles for the traditional Jewish Passover meal. The actions of Jesus and his words prefigured the events that were about to take place — Jesus Christ as the Paschal Lamb, sacrificed once and for all for the redemption of sin. It is during this Passover meal with the apostles and with the words of consecration that we hear during every Divine Liturgy – Jesus is present to all in the mystical sacrifice that takes place eternally and unceasingly. This is God made manifest through the Divine action of the Holy Spirit, transforming in consecration the elements of bread and wine into the Real Presence of Christ’s Body and Blood. Christ’s sacrifice on the cross and the shedding of his blood in his mercy for us is actualized in a timeless manner now and again as an unbloody mystical sacrifice at every Liturgy on the altar. Beyond the capability of our very limited human understanding to grasp, Christ’s Real Presence in the Eucharist is through faith, the means to our eternal salvation in being united with our Living God, and it is the foundation of all that we believe. Click Here for the meaning and traditions of Good Friday in our Byzantine Catholic church.